Ken Onion creates knife art from his home in Ahuimanu. Pretty much, a knife is an extension of tooth and claw, and as primitive man was neither long of tooth nor sharp of claw, a knife was a handy thing to have. "The knife was the first tool," says Ken Onion, who knows a thing or three about knives. "Probably the most significant invention in the history of the world, because without 'em, we'd be extinct." Recently inducted into the Cutlery Hall of Fame, Onion is right up there with Jim Bowie and Chuck Buck on the cutting edge. 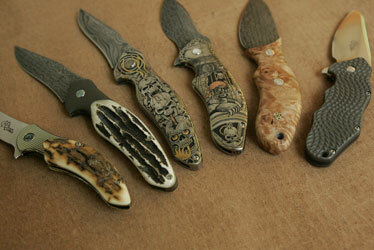 Onion has become one of the best-known custom knife makers and blade designers in the world, with creations going for thousands of dollars. Buyers have to enter a lottery for a chance to an Onion knife. Handle materials, from top left, include woolly mammoth bone, stag horn, two of engraved titanium, birdseye maple and titanium. Onion also uses his energy to support disabled American veterans. Not bad for a guy who operates out of his garage in Kaneohe. OK, it's a big garage, and he has his own CNC machine and a couple of employees. But still. "Redneck farm boy from Palestine, W.Va.!" grins Onion. He's a big, bluff artisan who moves carefully, thanks to an old mechanics' injury. "Wondering how I got here? Joined the Marines, shipped as far as possible west from West Virginia, fell in love with a hula girl and settled down. The usual." Not quite. Onion has always had a tinkerer's mind, and while in the Marines, invented a device still used by military helicopters. Once out, he kicked around with machinist jobs -- once reducing an airliner to scrap metal single-handedly with a power saw -- and played around with making knives. Wife Noel introduced him to custom knife maker Stanley Fujisaka, also of Kaneohe. Onion then took his creations to a Honolulu antique arms show and sold five out of seven. "That was a good kick in the pants," said Onion. He was inspired enough to invent a folding-knife locking mechanism dubbed the SpeedSafe, using a hidden torsion bar that helps pop the blade out as well as lock it in place. A SpeedSafe knife has the feel of a solid tool, not a wobbly toy. It took off. Onion has lost count of exactly how many patents he holds -- "40? 50? More than 30 ..." -- and about a decade ago joined forces with Kershaw Knives as name designer. The partnership has been a boon to both parties. Some sources claim Onion is the most successful knife maker ever. "It's a beautiful hobby, and also a business that took 20 years to build," he shrugs. 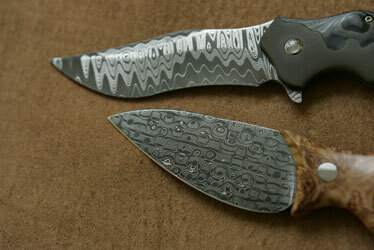 Damascus steel creates the layered effect in the blades. Fujisaka says the student has exceeded the master. "The SpeedSafe turned the industry over. Today a lot of people copy Ken's invention because it's so masterful. 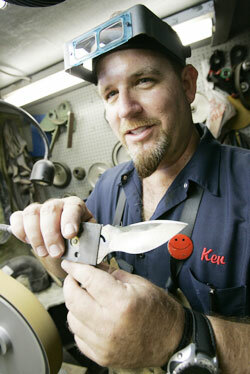 But Ken's also a terrific designer and his knives have a very different style." As a farm boy, Onion always had a penknife in his pocket. It was a modest tool, and yet, Onion daydreamed about knives. He doesn't explain it very well, tending to go mystic about man's relationship with this most basic of tools. "A knife ... is both utilitarian and a work of art," said Onion. "I had a knife in my pocket every day when I was in school. Had to -- needed it to do my chores." That's hard to imagine in today's zero-tolerance schools. "Oh, you get in trouble if you even have a butter knife," said the knife maker to the stars. "But I never thought once about pulling it out in a fight. And with a name like Onion, I was in fights all the time! "But when all the chips are down and you're stuck buck naked out in the wood, the thing you most need is a knife. Well, maybe a cell phone."